View & Send – The recipient business unit cannot edit the shared content, but can include shared content in a message. Edit Locally – This is an email only option. The recipient must create a local copy from this shared email before he can edit. Local edits are stored in local Content Builder folders. Edit Globally – The recipient business unit can edit the originally shared content. Caution: Any edits will overwrite the content for all other business units the content is shared with. This release adds an interactive Image Carousel block for macOS and iOS Mail apps that allows you to add a block with up to 5 rotating images to an email. You can set these images to auto-rotate every 6 seconds, but the carousel also has navigation arrows to manually rotate the images. Each image in the carousel can have a unique link defined. In unsupported mail clients, the block displays only the primary image as a static image. Scale to Fit Rendering Improvements: Not all email clients support the Scale to Fit option on images. This caused emails to potentially distort, most notably in some versions of Outlook on Windows. You can now enter a fallback height and width when Scale to Fit is selected. Non-supporting clients will use these values. Assigning a fallback width and height to all images in Content Builder using Scale to Fit is recommended. In addition, several Content Builder features are now keyboard-accessible and this release adds 6 empty layouts to the system. More details about the updates to Content Builder can be found on the Salesforce documentation website. Improved search in the campaign selector in the Properties step of the email creation flow. You can search a large number of campaigns to find the campaign of your choice. Enhanced experience for CC and BCC configuration. These enhancements are only available for Content Builder email sends and the Automation Studio Send Email activity creation experience. If you purchased Prebuild Burst Sending, you can now use this feature in Content Builder email sends and Automation Studio Send Email activities. The new version of double opt-in supports accounts using subscriber key and encrypts the data in the confirmation link. Salesforce advises implementing the new version. The new version also supports email address if this is used as the subscriber key. Refer to the updated documentation for configuration details. A/B Test sends now correctly displays test failures. If an error occurs during a job that is part of an AB Test Send, the overview page and the details page indicate this. This release adds upgraded support for opens and clicks via a new user interface. 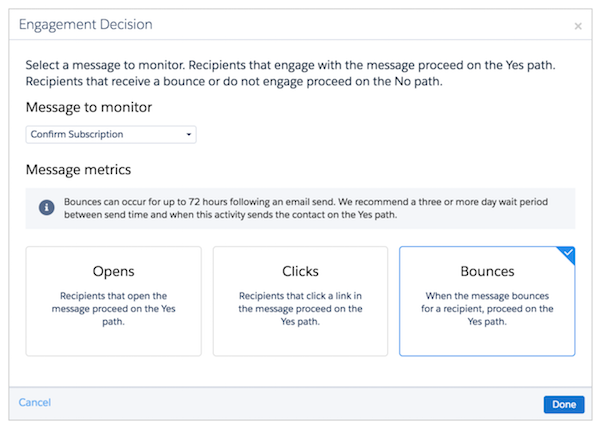 the new enhanced email engagement split activities let you choose a path based on whether the customer engaged with an email. The new user interface adds upgraded support for opens, clicks and bounces. With Einstein Engagement Scoring (EES) Marketing Cloud users can use predictive customer engagement behaviour modelling without the help of a data scientist. It enables them to improve ROI on email sends and Web conversions and helps them to understand the quality of subscriber lists and to better target customer segments. Watch the video below, or learn more at the Salesforce documentation website. To get an exclusive look at the new features in the October release, join the Salesforce Marketing Cloud webinar on November 16. Click here to register.